Montreal Grand Prix is one of the city’s hottest most glamorous weekends! 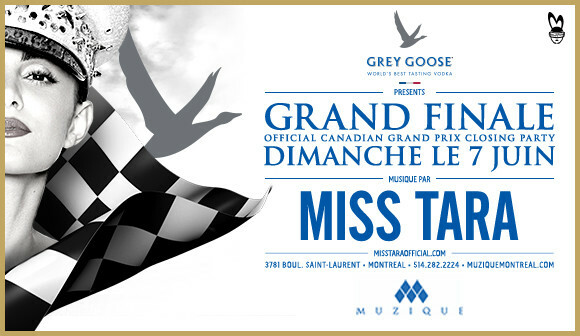 Miss Tara takes over Muzique Sunday June 7th at the Official Grand Prix Closing Party, presented by Grey Goose. The 7th of June, Sunday, was the final day of the Canadian F1 Grand Prix and was also the same day DJ Miss Tara played her music to the official Grand Prix closing party. DJ Miss Tara was playing at Muzique located in Montreal, Quebec. Club Muzique is widely known as the place for those whom never see the night age into dawn, the music never skips a beat, and the guest list is filled with a star studded lineup. From the host herself Niykee Heaton to the world’s best tasting vodka in Grey Goose. The party started on the 5th of June, Friday, continued on the 6th of June, Saturday, and finally concluded on the 7th of June, Sunday. Miss Tara, her stage name, is actually Tara Mobayen and was the youngest of her family. She was born in Shiraz, Iran and would usually spend most of her time on the farm with her father. Her father had a university job which, she confesses, resulted in going to different cities and starting fresh. Miss Tara though, accepted the challenge of reconstructing and restructuring her life every few years, allowing her to adapt to any place and circumstance. Her music career started at the age of 8 with classical piano and theory, however her parents revealed she veered into loud music and dancing in front of her mirror. She then started her career in modeling winning in 2009 as Miss Photogenic during her time competing in Miss Universe Canada. Today she has an international music career as a DJ and music producer. She also moonlights as a fashion model. As can be evidenced from DJ Miss Tara’s many appearances, her popularity and potential is skyrocketing and her services have been called for the F1 GP again in Montreal.